One of the key elements of Windows Phone 7 is the integration with localization services. The devices ship with Bing Maps and Bing Search enabled, both of which can be used to find local businesses and services. If you’re more interested in a third party solution, however, Poynt, a Windows Phone app using GPS, is a very useful tool that merges business and location search with weather and sharing tools allowing you to effectively plan an evening out with friends as quickly and easily as taking your car for repairs. It’s a novel approach, and best of all Poynt is free to download! When you first run Poynt, it asks you to confirm that you’re accepting that it will use GPS and your phone’s location services to detect your current location. This can be changed at any time by tapping the grey bar at the top of the screen. With the legend “where can we poynt you today?” displayed across the screen, Poynt offers a choice between businesses, restaurants and movies, as well as displaying the current weather conditions where you are. Tapping any of the three choices displays a search tool, and you can swipe left or right to change between the three categories. Sadly the people search tool (found in the business search) doesn’t work outside of North America, so it is difficult to test the success or otherwise of this feature. Using GPS and localization services you can find the nearest restaurants, businesses according to your search phrase and even people. Poynt ties in to various useful online services; for instance you can book a table at a nearby restaurant using the toptable.com service which is launched in your phone browser. 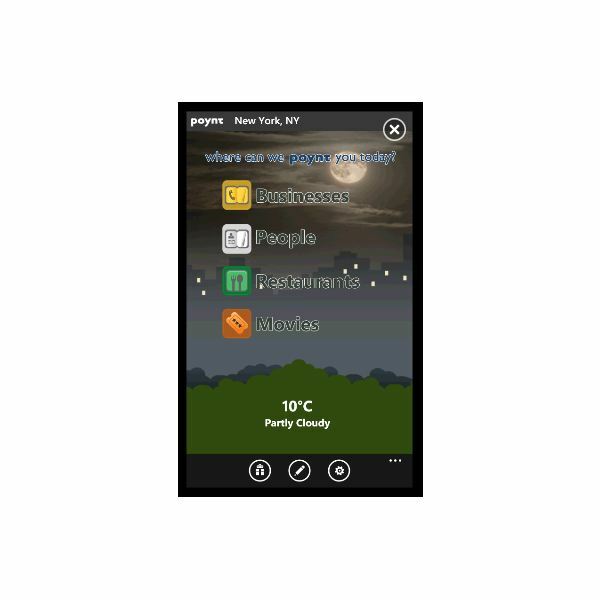 Poynt makes good use of the Windows Phone 7 Metro UI and settings for GPS, weather, and units of distance can be altered via the icon on the main screen of the app. Windows Phone 7 devices are all built to the same minimum spec, which means that all apps should work on all devices. Available free from the Windows Phone app Marketplace, Poynt has received a great feedback score, although some locations might not be present on the app as yet. Device-wise there doesn’t seem to be any issues reported, so success with the app really does seem to be down to the sources the app uses to populate its various searches. As a free app, one can have few complaints with Poynt, although some have remarked that the UI is a little untidy. 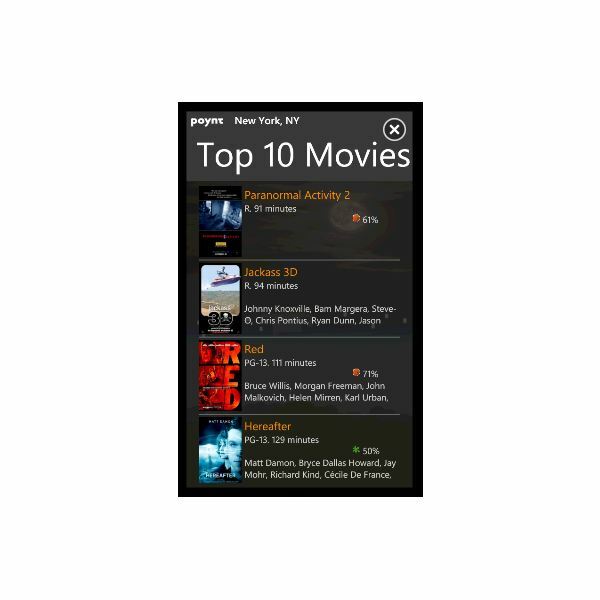 A useful mobile app, you might come to Poynt expecting little more than a clone of the services the native Bing app delivers to your Windows Phone. However, Poynt strives for something else, offering cinema ticket and restaurant table booking along with the typical maps and directions (which in fact utilise Bing) and sharing tools that you might expect from such an app. Poynt offers a great combination of tools for arranging nights out and dates, but outside of North America business and people searches are limited. 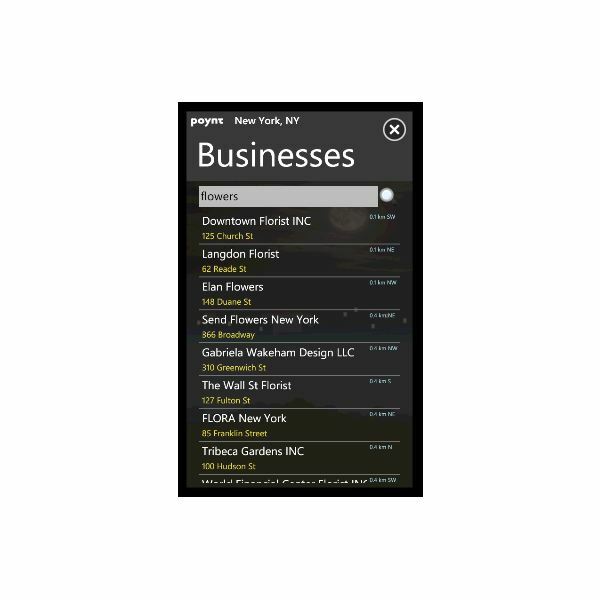 All references and screenshots from Poynt for Windows Phone 7.